E1 may be our lowest cost media playout solution, however, it still provides many of the important features needed to insure a successful event. Everything needed for operation is contained in one easy to follow resizable window. 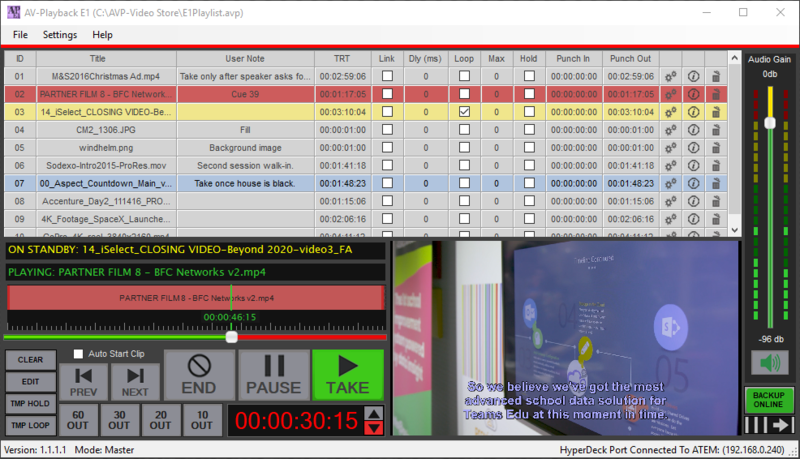 In order to offer such an inexpensive, playout solution, some sacrifices had to be made such as an independent preview engine, multiple layers, and any crossfading transitions. However, this streamlining did enable us to create an extremely reliable GDI based video engine that will not suffer from possible system compatibility issues sometimes associated with DirectX based graphic renderers. It is also incredibly efficient in its use of available system resources enabling you to still playback very high-resolution videos smoothly even on lower cost and less powerful laptops. As Promised though E1 is still an application designed for professional use, providing features like clip linking, looping with the ability to set the maximum number of iterations, auto freeze, as well as the ability to save user notes. High Performance Media Buffering: Considering the wide range of varying capabilities a users computer might be equipped with, E1 provides two different ways to manage how the app utilizes system memory. For systems that are not as well equipped, you can opt to not pre-buffer. In this situation, each clip is only loaded when selected. This dramatically reduces the amount of system memory needed. Although there is a downside to this, in that it requires more time between selections to load media into memory. It is only recommended that option only is utilized if only occasional playing of media files and there is ample time in between to set for your next cue. Remote Command Listener: Open its UDP packet listener and E1 conforms perfectly with our AVP Connectionless Protocol enabling operation via any third party device that can transmit custom ethernet command strings. 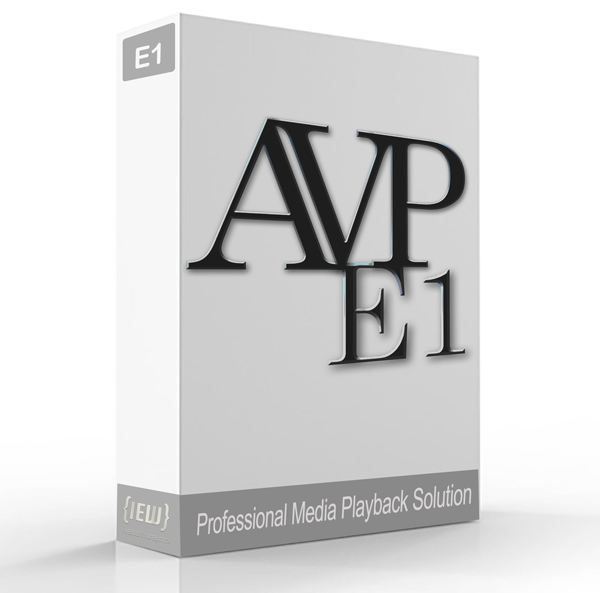 Try AV-Playback E1 for yourself and see first hand just how easy it is to use!